I spent June and July immediately after finishing my degree teaching school children and people from Help for Heroes to scuba dive. 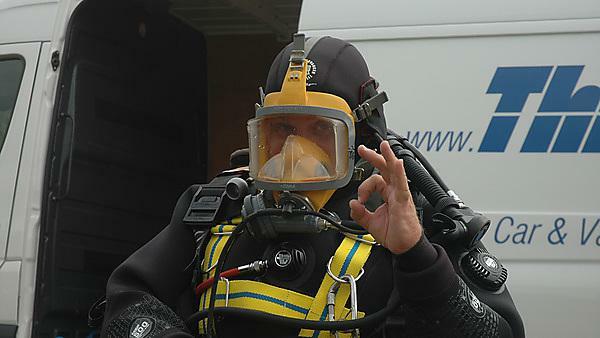 I also undertook a variety of commercial diving jobs. During this time, I secured my job at the UK Hydrographic Office, which I started in the August after my degree. It is very early days. At this point I have only been in the post for three weeks! However, I really enjoy “flying” above 3D renditions of seabed images I’m processing and seeing the wrecks and features on the seabed. The final decision to give up my career and undertake the degree was rather last minute. I think, if I had more time prior to starting, I would have undertaken a bit of preparatory reading. It was 30 years since I had left school; whilst I never stopped learning throughout my career, I had to relearn to study academically. Two reasons for the choosing Plymouth: 1. Plymouth University is well known and respected within the hydrographic industry for this degree course; 2. as a married man with children, it would have been difficult to study elsewhere so I was very lucky that this course was offered in my home town. I really only used the library, but it was such an amazing resource – not only in the immediately available services but also when I needed a paper that was unavailable, the library sorted this out for me. I loved being out on the boat (Falcon Spirit) deploying survey equipment and working with the team to collect data. Although, I would also say that spending time off Perranporth Beach using a drone to collect data for my third year project was great fun too – the sun was shining! The degree is very specific to the industry and has given me a broad range of survey skills along with the theory behind it. Although it is early days, this has already proved incredibly useful in my employment. The practical work gave me a good taste of what life might be like working on board a survey vessel in a variety of conditions! The University is large, well-resourced, and a pleasant place to study. With regards to marine science, the facilities, equipment, and fleet are without comparison anywhere in the country. For those interested there is also the chance to qualify as a professional diver (no other university offers this). On top of this, Plymouth, with sea to the south and Dartmoor to the north, is a great place to be.